Given these particulars, oncologists may recommend different mesothelioma treatment options for different people. The preferences of the mesothelioma patient and his / her family also are considered in creating a treatment plan. Therefore, it is important for everyone involved to fully understand all available options, and then make a personal decision on what is right in their particular case. A mesothelioma treatment plan should be overseen by an oncologist. This is a doctor who specializes in cancer treatment and is more likely to be familiar with mesothelioma than the most physicians. Because of the rarity of this disease, it is encouraged that patients seek an opinion from a mesothelioma specialist. Contact us if you need help finding a mesothelioma specialist. There are a variety of mesothelioma treatments; many are intended to attack the cancer cells while others address symptoms such as difficulty in breathing and pain. Most patients want to pursue aggressive cancer treatment initially. If the mesothelioma is diagnosed early in its development, this may be the best approach. There are three forms of malignant mesothelioma. 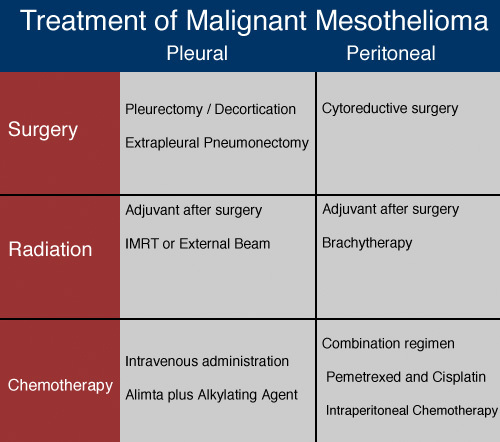 The most common is pleural mesothelioma, followed by peritoneal mesothelioma, and pericardial mesothelioma. Pleural mesothelioma affects the lining of the lung, peritoneal mesothelioma, the abdominal cavity and pericardial mesothelioma, the lining around the heart. For more information on these diseases, please contact us through the form below or by calling us at the toll-free number above. Radiation Therapy (using high-dose x-rays or other high-energy rays to kill the cancer cells). Often two or more of these treatment regimens are combined. Although we classify them as "traditional" treatments, there are many exciting and innovative developments within these treatments. The combination of Navelbine (vinorelbine) and Platinol (cisplatin) creates a highly active palliative therapy for patients with non-resectable malignant pleural mesothelioma. In a new study published by Danish researchers, 54 patients with newly diagnosed cases of malignant pleural mesothelioma were given the combination therapy. Two patients had complete responses and 14 others had partial responses. The median survival time for all patients was 16.8 months with a median time to tumor progression of 7.2 months. The one-year survival rate was 61 percent with a two-year survival rate of 31 percent and two patients lived more than three years. The authors of the study concluded this treatment regimen is as effective as current therapies and may even be better than currently used chemotherapy combinations.